Polka Dot Overload | Sewing, knitting & vintage projects, tips, tutorials and cartoons! : Pretty on the Inside? "My curator friend pointed to some very minimal overcasting and the lack of a lining inside a couture bustier, remarking how dramatically it disproved the home sewer's traditional conviction that well-made clothes must look as beautifully finished on the inside as the outside." —David Page Coffin, from "What is Quality Construction?" 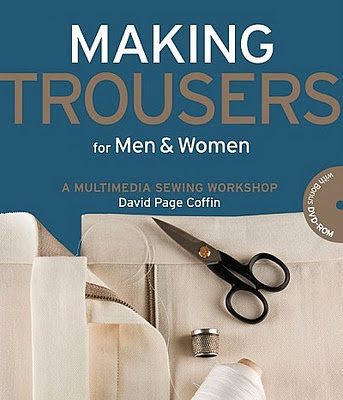 in Making Trousers for Men and Women: A Multimedia Sewing Workshop. Anyway, there will be no sewing tonight, seamsters. I'm just too tired after last night's basting marathon. Instead I'm curling up in bed with the above book and DVD/Combo. When I first started my trousers project I was far more interested in fit and the sewing process and this book and the accompanying DVD's exhaustive hundreds of pages of close-up photos of interior and exterior shots of trousers trousers trousers just overwhelmed me. But as I approach the waistband and pocket construction, I'm suddenly totally fascinated and happy to peer at great length at a variety of waistband finishing techniques until I pass out mid-pants-construction-photo stare. I realized that what I really want are trousers that hit at or above the natural waist, and these fit the bill perfectly (the pair I'm currently making are 1.5" below natural waist). *OK, I lie. One of the most fun things ever about making your own garments can be the extra love and care and fun, unexpected interior details and beautiful seam finishes... and I love seeing the cool stuff all you all are doing with the insides of your dresses and blouses and skirts. So go for it you have the time and inclination and that's your thing. But pinking and plain old basic overcasting are good, honest seam finishes too. So what's your seam finishing philosophy? Do you lovingly bind all seams with colorful silk bias tape... Or do you take my mom's approach and just leave all seams in their natural, fray-as-they-will state? It depends. Mostly I like finish the inside seams as beautifully as possible. However, as an intermediate sewer, on projects where I am not so sure how a finished seam will affect the order of construction, I err on the side of caution and go back when the garment is complete to finish my seams. I am a pinker (ok, that sounds weird?? hahaha). 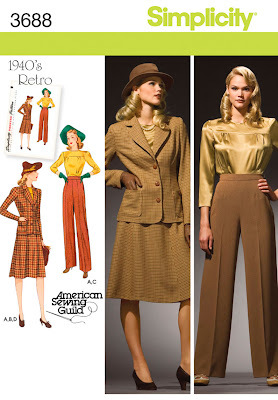 Sometimes I bind my seams but I generally think if the ladies in the 40's did it, and many of those homemade garments are still around...it's good enough for me! Thanks for the shout-out. I love that pattern...it's great to get the straight leg, high-waisted fit! I serge everything. I'm a lazy serger too. If I only have 3 threads in my serger because I've been working on knits, I'll switch to a 3 thread rolled hem to finish. So bad. You could end up with the perfect pants block.